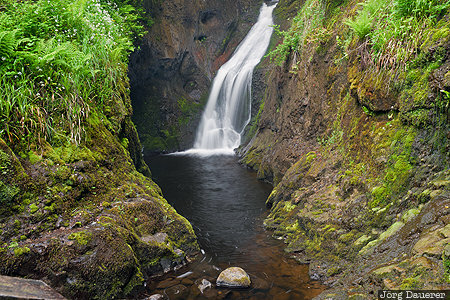 The water of Ess-Na-Laragh in the Glens of Antrim waterfall plummeting down in Glenariff Forest Park. The Glens of Antrim are in Northern Ireland, United Kingdom. This photo was taken at noon on a cloudy day in June of 2016. This photo was taken with a digital camera.